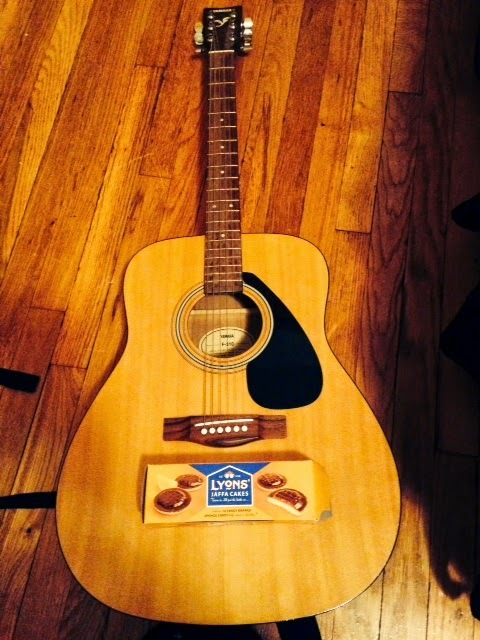 A guitar, with some Jaffa Cakes. A country music superstar, or to describe him more accurately, a bloke who sings in a cowboy hat, is alleged to be disappointed and a little amused with the fact that many of his fans, both in Ireland and other countries, have difficulty spelling his (two syllable) name. Garth Brooks, due to perform a number of high-profile shows this summer in Dublin, is the topic of conversation across the breadth of Ireland, or at least, in parts of the country where people don’t have other things to talk about, due to the fact that the Government of Ireland will not allow him to play a number of his scheduled shows in the capitol city. It appears that those in power are concerned with the thoughts of so many boggers arriving into Dublin without greencards or other necessary paperwork, resulting in an extraordinary influx of culchies overstaying their visas and according to one city-based councilor with a foreign-sounding name; ‘Stinkin’ up the joint and robbin’ our women’. Despite the continuing problems with Mr. Brooks’s concerts, or lack thereof, much of the pre-gig chatter concerns the inability of most of his fans to spell his name correctly. A quick investigation on Facebook, resulted in his name being spelled eleven different ways. The most common one, Gareth Brooks (there’s no ‘E’ in ‘Garth’) appeared on 149 different fan pages, while Garreth, Garret, Gary and Dave also showed up upon further searches. According to Dr. Peter Buachaill-Dana, a research scientist at the Tullamore Institute of Spellings, the mistakes are continuing to occur as; ‘His fans are gobshites’. The Heraldy Press asked Dr. Peter to elaborate on this, but he informed us that he didn’t know what ‘elaborate’ meant, then told us to go and shite. Concert organizers fear that the shows, which will go ahead on July 18th, 21st, 8th, 32nd, once more on the 18th, and back for a final encore on the January 3rd, will be a washout, as many fans may wind up going to see Gary Brookes, a jazz pianist, playing at Luscious Lawrence’s Lounge and Gazebo, due to their ongoing problems with spelling the singer’s name. When asked his opinion on whether the spelling of a name was a non-issue, or something we should be concerned with, Oliver McGoldrick (Mrs), a die-hard fan of the country superstar since earlier this month, said; ‘What?’ When we repeated the question, she said; ‘I haven’t a clue what yis are on about’. With as many as 39 country music fans descending upon Dublin from fields, forests, campsites, mountains and the skyscrapers of Edenderry to watch Mr. Brookleigh, whose albums include ‘9 to 5 (What a Way to Make a Livin’), ‘Achy Breaky Heart’, ‘Kenny Rogers Greatest Hits’ and ‘The Best of Dolly Parton’, it’s a fun time to be a country music fan in Ireland, at least on those dates it is, because we hear it’s shite most of the rest of the time, what with the brutal weather and not being able to spell and all. Story by Bosco Coppell Picture by Badger Grogan’s Bridal Wear.